Listen, people. I know. 2018 is over halfway done and here I am posting a top 10 of 2017 list like I’ve lost track of time. I know what date it is, but I’m finally ready to kind of sort of finalize this top 10 list. See, playing all of the major games of a given year is extremely difficult and costly, so I don’t really try. But 2017 was my first full year as a member of the board game media, so I finally was able to play a good chunk of great new games rather than lagging behind by years. So at some point I realized that I could make a proper 2017 top 10 list and not have too many games excluded because I haven’t played them. And what a year it was! I’m biased because I’ve played more 2017 games than any other year, but, still, this has to be one of the greatest board game years of all time. What a treat! I think it’s probably my favorite game year ever, although 2012 was pretty spectacular. Anyways, at the end of the year I told myself that once I’d played all of the 2017 games in my posession I’d do the list. Unfortunately I had a copy of The Expanse, that upon opening it, was missing some critical components. It took literally months to get that sorted out with Wizkids. I handcuffed myself arbitrarily, which is why this list is so late. And I still haven’t even played Azul, so it’s all a sham! 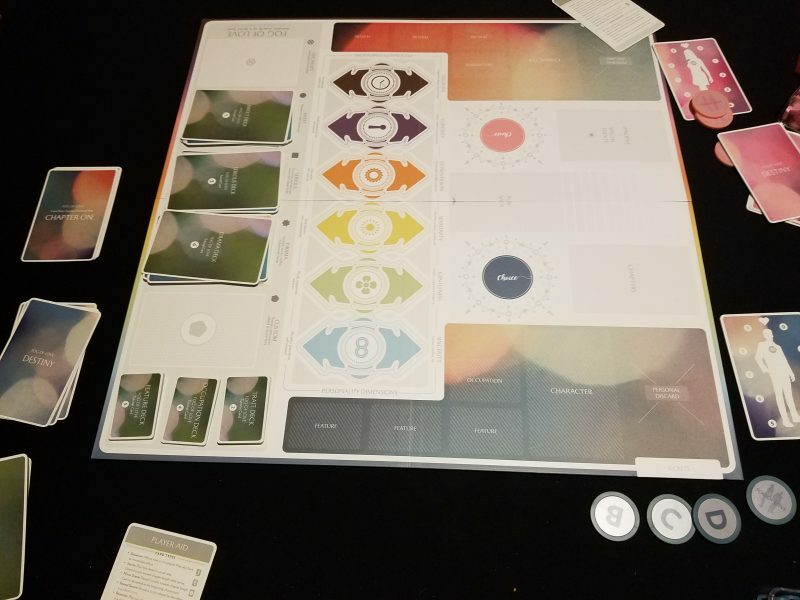 The first two player COIN game manages to transport the action selection mechanism to a two player experience surprisingly well. While it doesn’t have as many interesting dynamics diplomatically, this is still a solid entry into the series. I haven’t played this as much as I’d want, so I look forward to seeing how this either shines or falls with more plays. I think I prefer the multiplayer COINs I’ve played, but it’s such a strong platform and this conflict is pretty interesting, so it earns a spot on this list. 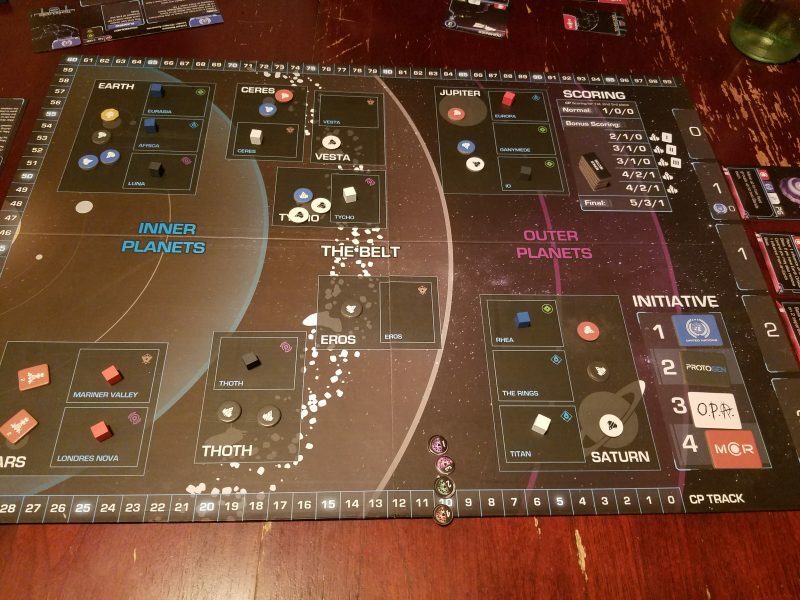 Putting aside the bitterness from the missing component snafu was simple once I dug into my first game of The Expanse. 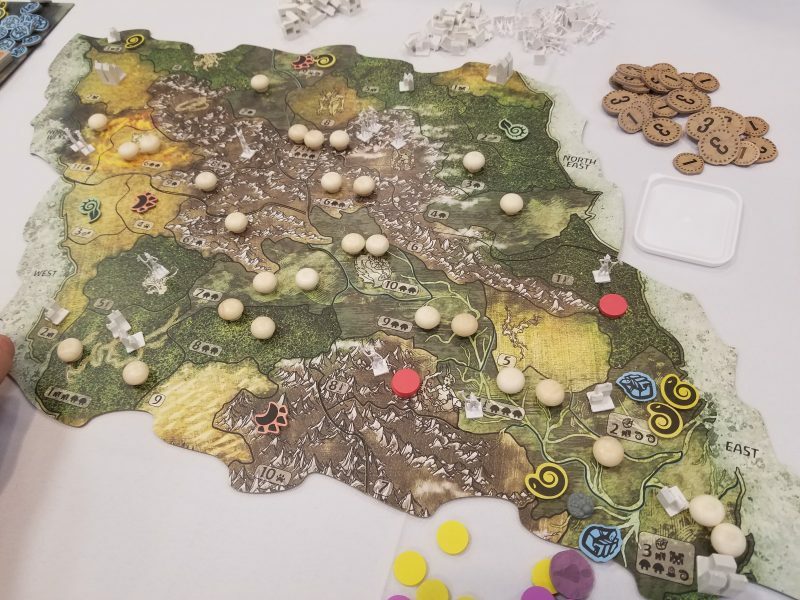 It takes a dirt-simple area majority concept that anyone who has played El Grande will recognize and spices it with subtle and deft CDG touches. There’s a bit of COIN, a bit of Twilight Struggle, and a lot of cubes. I love how the simplicity doesn’t detract from the decision-making complexity. For example, victory points are the currency in the game, which removes a layer of resources that you’ll see in many games, but it makes decisions in which you spend points more stark and grueling. The initiative track for determining who can execute actions when operations points are chosen by a player is similarly elegant. I wish the map and the cards were more visually interesting, but the game itself is rock-solid. It’s 30 minute Agricola with crazy player powers and it somehow works. My review covers more details, but I have to say that this game really holds up over multiple games with different people. This might be the most underrated game of 2017. I have absolutely no clue why it hasn’t gotten more notice because everyone I play it with seems to love it. Maybe I don’t have enough Euro-cynicism yet, because I find Nusfjord absolutely delightful and I keep seeing people comment that it’s something they’ve seen before. Yeah it’s got a lot of familiar mechanisms and the theme, while kind of cool, isn’t particularly exciting. But it’s not what the game is about, it’s how it’s about it, and Nusfjord is simply fun. You’re going to get giant piles of fish and/or wood, and you’ve got to figure out the most efficient path to turn all of that into points. 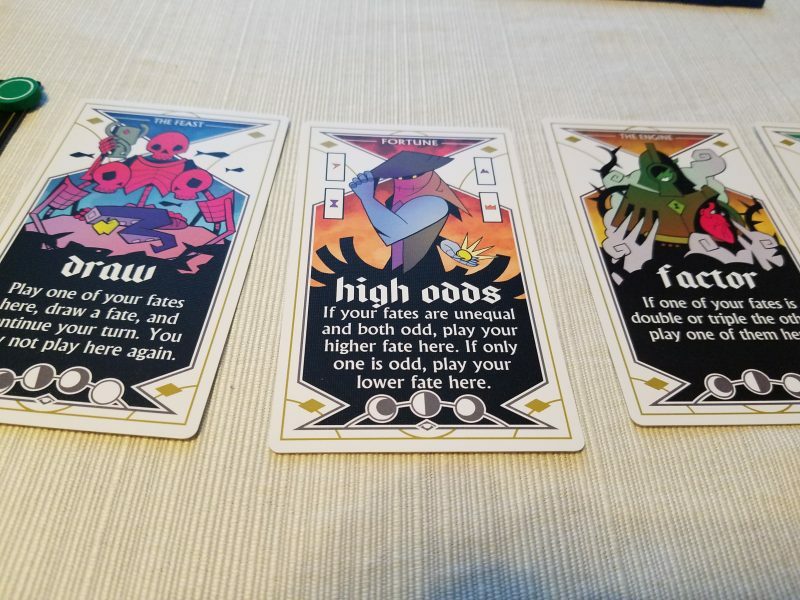 There’s a good amount of variability, a cool mechanism by which acquiring powerful cards makes a completely separate VP-generating action more lucrative, and a sunny art style. When I play Nusfjord I know I’m in the stable hands of a great designer, and I don’t care how many times he or someone else has made a similar game before. Playing Nusfjord is fun. Occasionally I’ll second guess my 8.5 rating of Downforce, thinking to myself, “yeah it’s hilarious but it’s quite simplistic–how fun is it really?” Then I’ll play it again and receive my answer–VERY FUN. This ludicrous racing game is guaranteed to bring trash talking to your game table as everyone tries to squeeze their cars through narrow gaps and block people behind them. A reasonably interesting metagame can develop as different betting strategies take hold. And I can assure you that Downforce is still a blast even if you lose, horribly, multiple times in a row. Believe me, I know. I’ve been pondering in my mind, nearly daily, how to fashion my review of Fog Of Love for months. I think I’m almost there, ready to commit my thoughts to paper, finally, but there will always be some level of uncertainty. I think this is a brilliant game. Its flaws and sometimes over-simplicity are outweighed by the sheer emotional weight of playing it. I don’t know if I’ll ever be in a mood to play it again, but I’m fine with that. And I am reasonably sure that very few people had a similar experience to mine while playing it. It combines role playing with the prisoner’s dilemma and emotional vulnerability. What a game! Yeah it’s a point salad, but what a great one! I absolutely love the round board, the player mats that nudge each person towards different strategies, and all of the variabilities on set-up. I love the ways you can generate more dice to play with, making the last half of the game a relative bounty of opportunities compared to the first half. Most of all, that dice drafting! Absolutely the best. Pulsar doesn’t break a lot of new ground, but everything it does it does well. 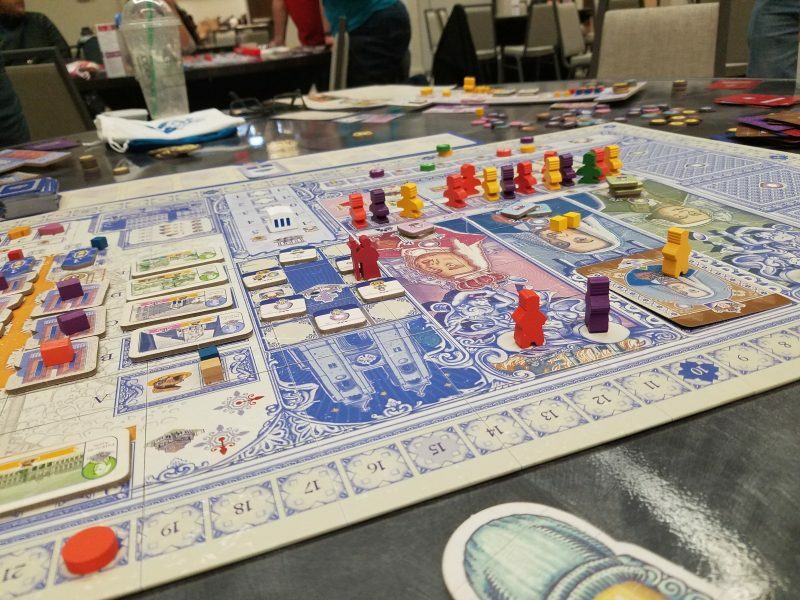 Any year with a new Vital Lacerda game is a good year, and Lisboa might be his best. A labyrinthine learning curve opens up into something remarkably interconnected yet coherent. I would have never thought that rebuilding a city could turn into something so incredibly compelling, and I would have never guessed that a game in which your turn consists of playing one card could be so involved. The subtle economic shifts are both thematic and genius. The semi-cooperative elements scattered throughout work so incredibly well. And once you get the point where you can make sense of it all, the visual design is truly extraordinary. Yeah, yeah, it’s a cop out to call the top 2 games a tie. But really they’re both incredible; two of the greatest games of all time. On my top 100 games of all time list a few months ago I gave Gloomhaven the top spot, so I’ll place it in the honorary second place this time. We’re still playing it fairly frequently, amongst plays of new games. If I didn’t have other games coming in and games I needed to review, this might be 80% of our play time. We’re finally retiring characters, accelerating into new content and secret envelopes. While the story isn’t great by any measure, which as I pointed out in my review was my biggest concern, the gameplay itself remains absolutely engaging. 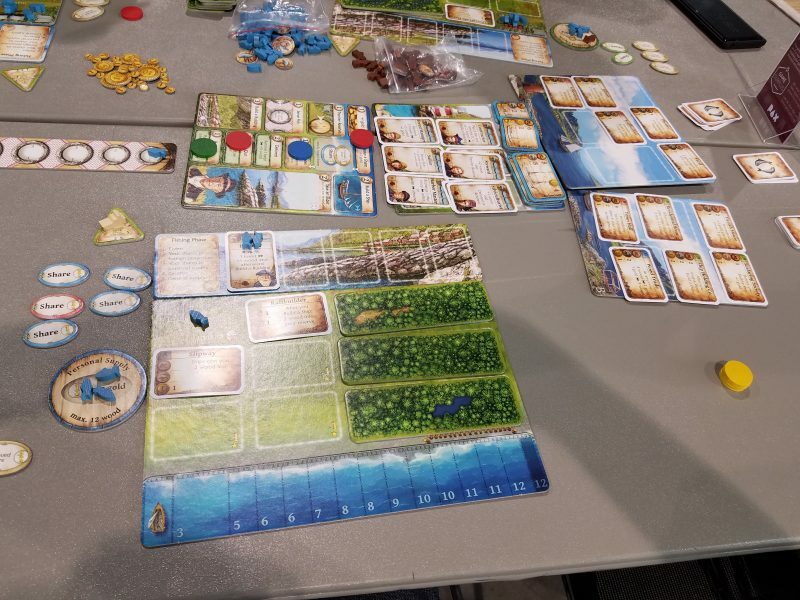 If you haven’t listened to our talk with Spirit Island’s designer, R. Eric Reuss yet, go ahead and do that immediately. My appreciation for this game only grew after talking for nearly three hours with him. There is an incredible amount of depth here. Yes, it’s mechanically complex and that might drive some people away, but there’s a narrative complexity here that you do not see very frequently. Each play is an absolute delight. There’s nothing quite like seeing your spirit grow in power, shape into something completely unique, and struggle against the relentless barrage of invaders. When’s that next expansion arriving again? Here I Stand and Twilight Imperium 4th Ed are both spectacular, and among the best games ever made. I didn’t put them on the main list because they’re effectively reprints. Yeah yeah, Downforce is a reprint too, but that feels different and I never played the original. Calimala is about as dry of a Eurogame as it gets, but boy is it compelling. With a high level of set up variance, Calimala is a fresh puzzle right from the start that only gains new depths as the other players muddle everything up. Paramedics: Clear! was a complete surprise to me when I played it earlier in the year. I’d never heard of it before, but this little competitive real time game is smartly designed and a complete blast. Time Of Crisis is a funky little GMT game that combines deckbuilding with a sort of kind of the hill take on trying to seize Roman control. It turns the deckbuilding into something meticulously controllable and the rest of the game into a mad rush of area control and violence. I don’t know quite how well it works, but I keep wanting to play to find out. For-Ex sure is something. I don’t know if it’s good, but there’s no doubt that it’s something. This is a deviously simple game that quickly spirals into a brain-burning exercise in trying to figure out what on earth to do. Everything that happens in the game is the result of something someone does. And everything that anyone does changes a huge chunk of the game. You’ll be able to figure out what you can do fairly easily, but what that means is anybody’s guess. The Shipwreck Arcana is my biggest pleasant surprise of the year. I didn’t even know it existed until I spotted its beautiful art at a random booth at PAX. One quick demo later and I was sold. It’s a wonderful game of deduction with actual layers. Many deductive games require you to solve a puzzle. This one has you solve a puzzle, but also try to figure out what puzzle the other player was attempting to optimize. Did I mention it’s beautiful? Well, that’s what I’ve got for 2017. I will get around to playing Azul at some point, and I won’t be surprised if it finds itself among these ten truly wonderful games. But I can’t wait forever. I’m still waiting for 2018 to give me games as good as these. Here’s hoping Essen brings some new surprises.